These hands / snap branches / light matches,” writes John Tritica. Always attentive to rhythm, pitch, and sound, these poems unfold in tonal clusters and marvelously enact that process of discovery where one finds that “narrow foothold / from which to propel / where all is at risk. 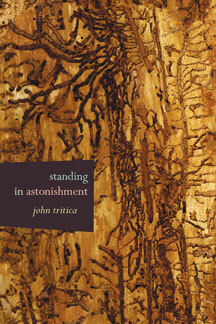 John Tritica is fluent in miracles often unnoticed. His work finds its grounding in the bedrock solidity of life lived in the high desert, the angle of the light, reflections on mortality, and the desire to “sign bloom compose.” Tritica creates his own neologistic compounds throughout the book: “pagescape,” “windward,” “neckstretch,” “leafshadows,” “catchslight,” “tonguethick” where each syllable is comprehensible and the compounds build complexity & playfulness. Language as it occurs on-the-fly, in observations of the everyday extraordinaire, leads to investigation of form. The textures of the leading vowel sounds and poetic meditation intersect with experiments of composition which gracefully shape the page. Unconventional punctuation, line-breaks, and caesurae enhance the feel of sound in the mouth as the poem becomes a musical score. In the short poem “Ocean Blaze Returns,” Tritica takes his title for the book. Nowhere in the poem does the word “surf” appear, yet the experience of a surfer becomes clear, entering the green room (“tubed”), and upon coming out, proclaims to be “standing / in astonishment.” Part physical wonder, part existential statement, Tritica’s poetic world functions as a guide in the complex contemporary world our words inhabit. Born in Montana, spending his formative years in Los Angeles and San Diego, John Tritica has lived in Albuquerque for decades. He is a founding member of L)Edge and worked closely with Mary Rising Higgins and Gene Frumkin for more than twenty years. A teacher by profession, he studied at University of California, San Diego; Miami University; University of New Mexico; and Lund University in Sweden, where he became friends with Niklas Törnlund. John has translated Törnlund in a volume called All Things Measure Time (Landlocked Press, 1992). Published widely in many journals, his books include How Rain Records Its Alphabet (La Alameda Press,1998) and Sound Remains (Chax Press,2008). Together with his family, John lives in the city, where they cultivate a garden.